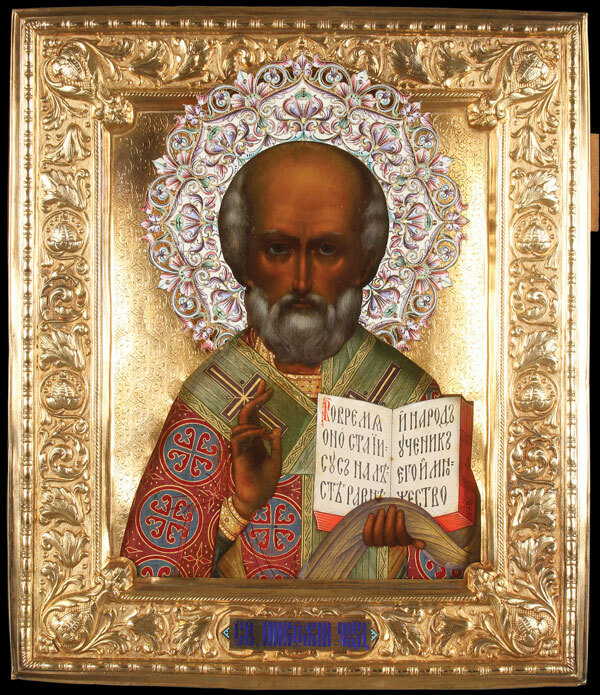 Perhaps one of the most unique icons offered was a 12 x 10 inch icon of St. Nicholas, circa 1900, which had been presented to Pope John Paul II during a visit to the Vatican by then President Boris Yeltsin on December 20, 1991. The icon was in turn given by Pope John Paul II to his secretary Stanislaw Dziwisz who in turn gave it to his good Polish-American friend, Monsignor Michael Dylag, the consignor. It sold for $143,750.00 to a collector in St. Petersburg, Russia, against a pre-auction estimate of $10,000-$20,000. The sale opened with a fine selection of Russian icons including a very Western-style oil on metal icon of the Last Supper with ornate gilt-bronze Byzantine framework dated to circa 1890 and which ended up selling for $262,000.00 against a pre-sale estimate of $15,000-$25,000.00 There have apparently been three similar icons contained in identical frames surface in the last decade, the first one sold was attributed to as having come from the famous Moscow Cathedral of Christ the Savior. However, further research has shed doubt on that attribution. 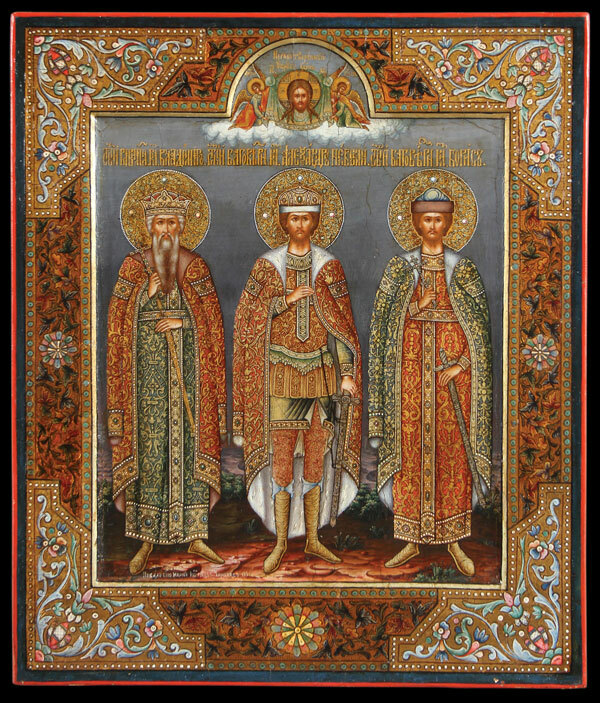 A scarce 12 x 10 inch icon depicting saints Vladimir, Alexander, and Boris from the workshop of noted court iconographer Iosif S. Chirikov, signed and dated 1891, sold for $250,000.00 against a pre-auction estimate of $30,000-$50,000. The icon attracted seven phone bidders (all from Russia) and ended up selling to a collector in St. Petersburg. That was preceded by an 18th century icon depicting the Last Judgment and measuring 21 x 17 inches. It, too, sold to a phone bidder bringing $125,000. Other noteworthy icon sales include an interesting western style example depicting St. Alexandra, executed on copper and with silver frame by Ovchinikov and with the verso displaying a dedicatory inscription on dated 1909 and related The Krupenskiy family, a very large and wealthy aristocratic Bessarabian family from Moldovia. It sold for $62,500.00 to the phone. A small (3.8 x 2.8 inch) finely painted miniature image of Christ with silver frame by Faberge went to a buyer from Moscow for $50,000. A small 4 x 6 inch presentation icon triptych presented to the General Vladimir Antipov who from 1908-1915 was the headmaster of the Vladimir Military School in St. Petersburg, sold for and even $40,000, and a Russian icon of the Transfiguration measuring 12 x 10 inches and with Art Nouveau-style silver riza with the mark of the First Artel sold for $31,250. There were, of course, numerous other icon sales of note (indeed, over 250 icons were sold at auction). However, the aforementioned icons represent some of the more significant examples. Other Russian works worthy of mention include a small nocturnal Paris street scene by Konstatin Korovin that sold after the auction for $16,250, whereas a 12 x 19 inch watercolor landscape by Benois did $9,375, selling to a phone bidder from St. Petersburg. Although not a famous Russian artist by any means, an oil on canvas landscape by Alexei M. Prokofiev (1867-1925) also sold for $9,375, setting a new auction record for the artist. The painting, incidentally, was one of many that become embroiled in a U.S. Customs dispute related to paintings exhibited at the Universal Exposition in St. Louis in 1904. Lastly, a fine Tsar Nicholas II hand-signed photo dated 1916 sold for $10,000 and a small prayer book dated 1910 with dedicatory inscription to Tsarevich Alexi Nikolaevich was purchased by a Russian museum for $3,750. The second section of the auction featured both European and American works of art with the highlight being a 16 x 23 inch oil on artist board painting of a festive Indian encampment by American artist LaVerne Nelson Black (1887-1938), which sold for $115,000 to a private Midwest collector. That painting was followed by a Sierra Mountain landscape by American artist Edgar A. Payne (1883-1947) which finished at $50,000, selling to a California buyer via the phone. A typical bayou scene by Joseph Rusling Meeker (1827-1887) and measuring 16 x 22 inches sold to a private collector for $33,750 against a pre-auction estimate of $15,000-$25,000. A fresh to the market landscape in an original Newcomb Macklin frame by Tony Angarola (1893-1929) set a new auction record for the artist when is finished at $21,250 against a rather conservative estimate of $800-$1,200, and a spring landscape by Indiana artist Claude Curry Bohm (1894-1971) sold for $12,500. A good array of European paintings and art also crossed the block, including a large and impressive oil on panel painting depicting St. Ceclia by Belgian artist Julian Joseph de Vriendt (1842-1935), which sold for $30,000. That was followed by a 22 x 44 inch watercolor by Italian artist Gustavo Simoni (1846-1926) which depicted a carpet seller and was dated 1893. Estimated at $3,000-$5,000, the painting drew 18 phone bidders and a multitude of absentee bids, finally selling for $21,250. A somewhat atypical non-Highland landscape by British artist Aflred de Breanski (1852-1926) sold for $11,250 and a painting of 12 dancing princesses by French artist Emilie Henry Blanchon finished at $8,750. Other European, Old Master, and Spanish Colonial works include a silver-gilt cased monstrance by Paul Brunet of Paris which did $8,750, and a Spanish Colonial carved and polychrome figure of the Virgin made $10,000. A Spanish Colonial painting of St. Anthony cataloged as circle of Marcos Zapata (Peruvian 1710-1773) made $11,875 and a charming small oval painting of angels adoring the sacred heart by Mexican artist Jose de Paez sold for $10,000. European bronzes fared well, including a model of Fremiet’s St. George Slaying the Dragon, cast by Barbedienne, sold for $8,125. That was followed by a 19th century bronze figural hunt scene garniture which sold to a Russian buyer for $12,500. A “literary bear” by French sculptor Christophe Fratin (1801-1864) sold for $10,625 against an estimate of $1,500-$2,500, and an example of Louis Ernest Barrias’ “Fame” sold for $9,375. Other interesting sales include an oil on canvas abstract by Indian artist Laxman Shrestha sold for $17,500 against an estimate of $5,000-$7,500 and a two volume set of the History of the Expedition (Lewis and Clark), published by Bradford & Inskeep, 1814, and including the important fold-out map found in the first volume sold for $55,000. Typically a rare offering, as it so happened, the aforementioned lot was one of three two-set volumes that were offered at auction within 30 days of each other at various auction houses in the United States. A number of items from the now closed Little Norway Museum west of Madison, Wisconsin, crossed the block and included an interesting Danish silver presentation drinking horn dated 1886, which sold for $8,375, a small (7 inches in length) hand-carved Norwegian bent wood puzzle box dated 1782 sold to a private New York collector for $5,000, and a painted Norwegian wood wedding sleigh sold to a buyer in Moscow for $11,250. Other decorative arts worthy of note include a Sevres style gilt-bronze mounted bisque pedestal, which sold for $17,500, a large KPM plaque depicting the Old Testament scene of Japhthan’s daughter and her young companions made $25,000, whereas a pair of other KPM plaques, one depicting Christ with the adulterous woman and the other depicting the banishment of Hagar and Ishmael, totaled $15,000. The sale ended with a small offering of Asian works beginning with an oil on canvas painting of two women drinking tea by Vietnamese/French artist Le Pho (1907-2001) which sold for $40,000, another Le Pho depicting a composition of flowers sold to the same buyer for $31,250, and a pair of Le Pho floral still lifes totaled $19,375. The Le Pho’s were followed by a pair of paintings by Vietnamese artist Vu Cao Dam (1908-2000) which each sold for $18,750. Other Asian works worthy of note include a Chinese Blanc de Chine figure of Kwan-Yin and measuring just under 10 inches in height sold for $21,250 against an estimate of $1,000-$2,000, a carved jade figure of a resting water buffalo made $16,250, and a Chinese carved jade belt hook mounted as a magnifying glass handle sold for $7,500. This Russian icon of St. Nicholas, measuring 12.5 x 10.5 inches, presented to Pope John Paul II, by Boris Yeltsin accompanied with excellent provenance, sold to a buyer from St. Petersburg, Russia for $143,750.00. This 12 x 10 inch Russian icon depicting three saints, dated 1891, and signed by noted court iconographer Iosif S. Chirikov, sold to a Russian phone bidder for $250,000.00.